Repeal XVIII celebrates the repeal of the Prohibition era. Party like it’s 1933 at Repeal XVIII, a new bar in Huntington Village that is celebrating the repeal of prohibition. The bar was formerly The Artful Dodger and P’s and Q’s, and is now under the new ownership of Huntington resident, Michael Matarazzo. Former head bartender at the location for 11 years, Matarazzo knows the ins and outs of the business and is ready to bring his vision to Huntington. Matarazzo had a good foundation to work with. The bar was on the TV show, Bar Rescue, and host Jon Taffer converted it into a prohibition style speakeasy with a hidden entrance. But after a fire at the laundromat next door erupted a few months later, the bar was forced to close for a year and get rid of their secret entrance, slowing down its momentum. After becoming a partner last summer, Matarazzo decided to buy the owner out completely and run the bar how he wanted. 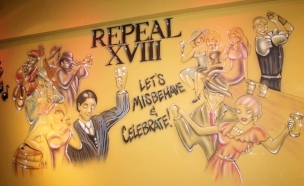 A newly completed mural inside Repeal XVIII celebrates the theme of the cocktail lounge: repeal of the 18th Amendment and the end of the prohibition era. Much of the vintage, 1930s style décor remained the same, but Matarazzo wanted to add a mural that showed a celebration of prohibition ending, included girls cheersing, a band playing and a bartender mixing drinks. “I had a nice core to work with but I added a lot of my own personality and character to it,” Matarazzo said. Matarazzo also refaced the front of the building, upgraded the taps, put in new seating and bar stools, added a 165 inch TV and four 65 inch TVs and made a fun photo op with a bench swing. 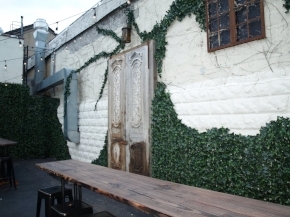 Patrons can step outside and experience a whimsical beer garden that features heaters, rustic doors from Holland and ivy vines climbing on the walls. The vibe is certainly unique, and it’s complimented by a revamped cocktail menu. Cocktails now feature herbs, spices, homemade simple syrups and purees, and infused liquors. These beverages can be enjoyed at any time. As a lifelong resident of Huntington, Matarazzo feels he knows the town well and saw it was lacking a place for a mature crowd to go out. He has put into place a rule that on the weekends, men 23 and older will be allowed in. Part of owner Michael Matarazzo’s vision was to create an outdoor beer garden that could be enjoyed all year round. Since he was 19 years old, Matarazzo has been a bartender and found a passion for the craft. Now, he has made his dream of owning his own place a reality, using his experiences as a bartender to shape the business. He describes his staff as “one big machine” that works together and best when they are happy. Matarazzo has laid out what he expects of his employees, holding them to the same standards he would hold himself to as a bartender. 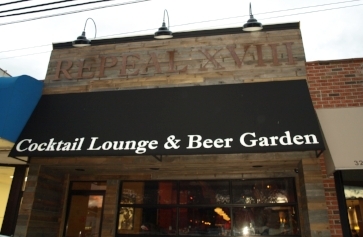 Repeal XVIII is on its way to becoming one of Huntington’s most happening joints. Prohibition is over and the bar is open Tuesday-Thursday; 5:30 p.m. - 2:30 a.m.; Friday-Saturday, 5:30 p.m. - 4 a.m.; Sunday, 12:30 p.m. - 2:30 a.m.